The Historical Museum Casona de Santa Rosa, is composed of historic rooms which permit you to know the most important facts that happened in the Hacienda de Santa Rosa. In this manner, one can enjoy an exhibition room about the Area Conservación Guanacaste (ACG). All of the rooms have pictures to allow you to orient yourself on the tour. We hope that you enjoy your tour through the country's history. 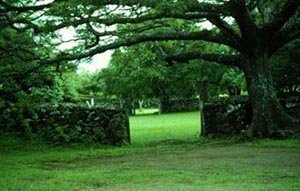 Santa Rosa was one of the oldest and largest haciendas in the country, there are dates of its existence as a site since 1663 where throughout the years and until 1966, there were agriculture and cattle ranching activities. Since its beginning, Santa Rosa was a house that was in the center of the large quantity of farms that composed the hacienda. It was not until 1863, when don Inocente Barrios Munos was the owner, that Santa Rosa was placed in the Public Record under the name Santa Rosa Farm. In 1663 there is, for the first time, the creation of what would become the land of the Hacienda Santa Rosa, due to the soliciting of these lands by don Juan Martin de Villa Fana, from the Queen of Spain. Afterwards, they were given to the Alferez don Joseph de Rivas (1736). Other owners have been: Juan Antonio Santos de San Pedro (1751), Ramón Gomez (1856), the Barrios Sacaza family (1895), and Luis Roberto Gallegos (the last owner). 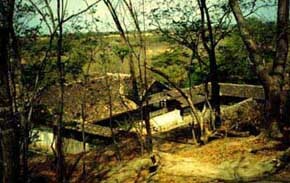 They lived in the main house of the Hacienda which is located on the south-west side of the Santa Rosa mountain. The original house was transformed in 1895, when it was enlarged and given the design that it now has. In 1919 the balcony was constructed and recently the Ministry of Culture and the National Park Services have been responsible for overseeing the necessary restorations to keep the historic site in shape. 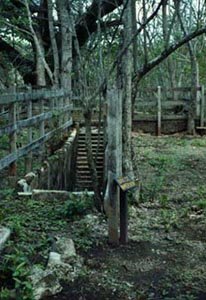 Located near the Casona are the stone corrals, built in 1700 (approximately), an in them you can still observe the bramadero, and to the south you can see where they bathed and cured the cattle. View from the back side of the Museo Histórico Santa Rosa. In the nineteenth century, Nicaragua was beset by political problems, which William Walker, an American, with a tendency to slavery, took advantage of. He believed in "Manifest Destiny" (where larger countries should control smaller ones). Walker offered his help in Nicaragua to try and solve their problems, thereby establishing himself in the country, but his real intention were to conquer the five provinces of Central America "Five or none". In Costa Rica, don Juan Rafael Mora Porras, the President, guessed the intentions of Walker and on the 27th of February 1856 declared war on Nicaragua and called all Costa Ricans to join forces and fight, a call that is heeded. They began the march on the 4th of March from San Jose to the northern border, led by the President, arriving in Liberia the 12 of March, where they joined the battalion organized there (Moracia Battalion), under the leadership of José María Cañas. When the freebooters of the Nicaraguan movement realized what was happening in our country, they sent troops, under the leadership of colonel Schlessinger, which entered Costa Rica through the road that joined Nicaragua with Liberia and which passed by the Hacienda Santa Rosa, where they arrived on the 19 of march. 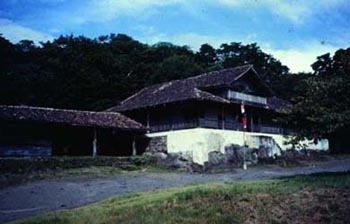 The Costa Ricans, meanwhile, began the walk to Santa Rosa and on the 20th of march at 4 o'clock, armed with rifles, sabers, and bayonets, began the attack, surrounded the troublemakers that had stationed themselves in the casona and in the corrals, and fourteen minutes later the Costa Ricans won the battle. 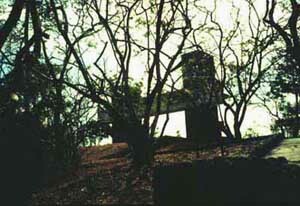 In the twentieth century, Santa Rosa was used many times as a battle site. In 1919, a group of 800 men, coming from Nicaragua, came into our country with the intention of overthrowing Federico Tinoco, arrived in Santa Rosa on the 8th of may and here they were beaten by government forces, who forced them to return to Nicaragua. This battle is known as the "Sapóa Revolution". In 1955, when don José Figueres Ferrer was president, groups loyal to Dr. Rafael Angel Calderón Guardia (Expresident of Costa Rica); who had been forced to leave the country; invaded our territory from Nicaragua, arriving at the Hacienda Santa Rosa, where there ensued a battle between Figueristas and Calderonistas, with the victory of the former. 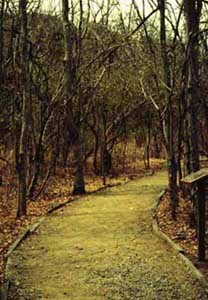 Indio Desnudo Nature Trail, located on the north side of the museum. Monumento a los Héroes, located on the south side of the museum. Stone Corrals, next to the parking lot. Immersion Baths, north of the stone corrals. Things to remember when visiting the museum. 1. Don't touch the objects or walls inside the Museum. 2. Don't enter the areas that are roped off. 3. Don't throw trash on the ground, use the bins that are located in the Museum. 4. Don't eat or drink inside the Museum, do it only in the camp grounds or in designated picnic areas. 5. When you are taking the tour, please do so silently and slowly. 7. Please don't take objects from the Museum, they are National property. 8. It is prohibited to enter the Museum without a shirt.